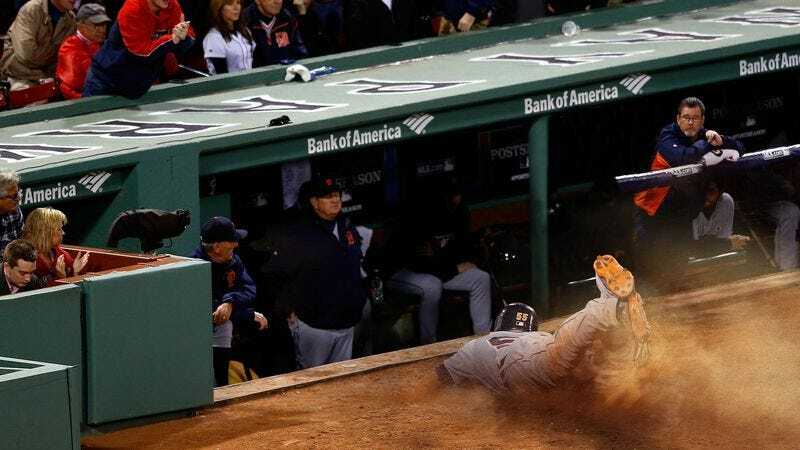 NEW YORK—According to a report released by the MLB league office Friday, injuries have significantly risen this season as a direct result of more players opting to slide headfirst into the dugout. “Concussions, dislocated shoulders, and season-ending bone fractures are just some of what we’ve seen this year as an increasing number of players are diving headfirst into the dugout at full speed,” said MLB commissioner Bud Selig, adding that the practice has resulted in a slew of serious injuries to not only the player sliding, but also teammates and coaches occupying the dugout. "While it’s not technically breaking any rules of the game, we are considering measures to outlaw the practice entirely. We’ve simply seen too many instances of players being overzealous and slamming their backs against the concrete wall above the bench or accidentally taking out a group of teammates leaning on the railing.” Selig added that the league is also considering improving safety by banning outfield players from launching themselves cleat-first into the stands with both feet while attempting to catch a foul ball.